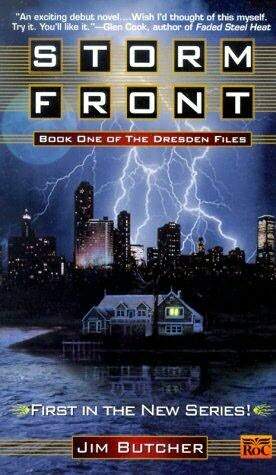 This, the fifth book (the third I’ve read) in Jack McDevitt’s Academy Series, is my favorite so far. 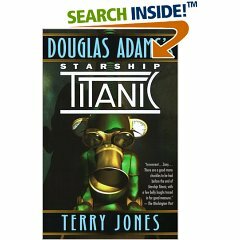 The story has the Space Academy setting out to investigate sightings of spherical alien ships, and discovering a few nasty surprises. 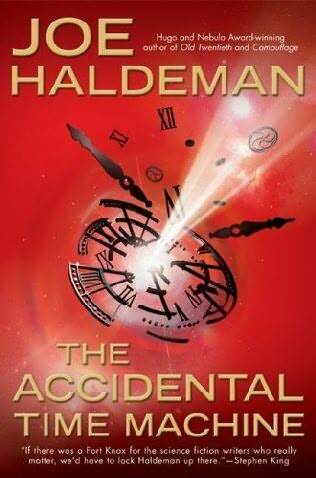 In this novel you will find all the imaginings of alien wonder that have made the series enjoyable, with extra helpings of adventure an mystery. 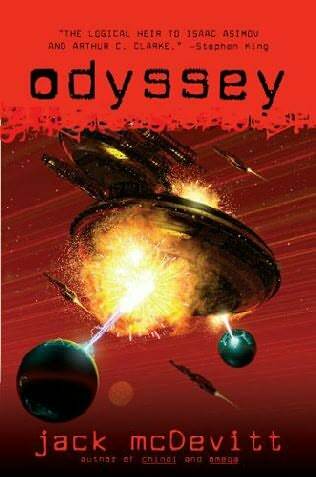 Odyssey may end up being the last book in this series, since at the end of the novel the series protagonist, Pricilla Hutchins, retires from the Academy. But you never know. I love Terry Pratchett’s Discworld series. There are a lot of them, and they are all pretty similar, so what happens is you’ll read a Discworld book, think, “That was awesome! Gimme some more,” read another book or two, then suddenly become sick of it for a few months or years. 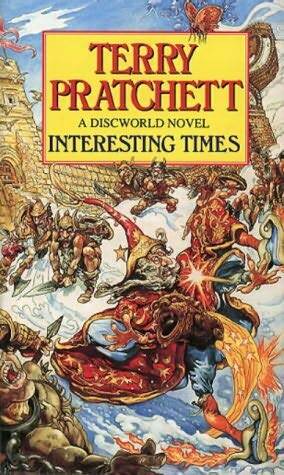 Right now I am in a Discworld groove, currently reading my third book in two weeks. 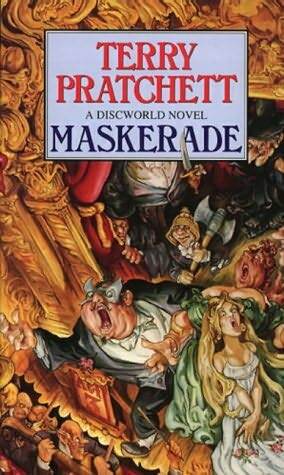 Maskerade is the book that got back into the groove. In this one, the Lancre witches travel to Anhk-Moorpork to track down and recruit into their coven Agnes, who is pursuing a career in the opera, but who really came to the big city just to get away from the witches. Of course, as in all Discworld novels, the plot is just a vehicle for the side-splitting hilarity. With a Phantom of the Opera parody as a backdrop, and seeing as how I work in theater, I found this episode to be especially entertaining. You know, it’s a sad day when it takes me more than an month to read (let alone find out about!) the newest Redwall book. Ah, the perils of pursuing a PhD. Anyhow, I took my one day off in two months to power through my favorite of non-science related books. It’s been awhile since a new Redwall book has come out, and I think the time off has done Mr. Jaques good. That or the time off did my reading brain good. Either way, I thoroughly enjoyed this book. Some of the more recent books in the series seemed slapped together to me, but this one brought back the beauty of the stories. At one point there was even a sly reference to the very first story, which, admittedly, I first thought was the author reusing an old idea. That got me a bit upset, but he turned the tables on me! What a clever man. Anyhow, the story is the melding of two historic destinations in the Redwall world: Redwall Abbey and Salamandastron. A hare made is sent on a dangerous mission to find Salamandastron’s new Badger Lord, who is prisoner on a vermin ship. Fates collide with a young thief, a band of shrews, and a cheeky squirrel who join forces to protect the innocents at Redwall. Overall, this was a great book. There were laughs, daring adventures, and several teary-eyed moments. The ending gave me the predictable goosebumps and misty eyes, and I slowly read the epilogue to try and make it last longer. 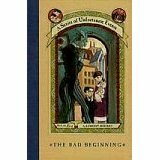 Interestingly, this was the first book where a Badger Lord mates for more than a few seasons, and the first book where a female badger becomes Lady of Salamandastron. I wonder if Brian Jaques has a daughter–that would explain the sudden shift in badger biology. Anyhow, it was a nice way to spend my Saturday. This was my first audio book ever! It was cool because it allowed me to “read” while doing other stuff like playing Civ IV or doing bookkeeping or whatever. Unfortunately this also causes me to miss some of the smaller points, but for the most part it is satisfying. The book itself was great. 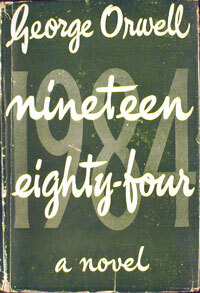 It was written in 1948 about a future in which the moral authority sees everything and controls everything. Personal freedom, even of thought, is less than an memory. It is depressing, frankly, and a little scary in its resemblance with the current American social and political climate. Overall it was very good. I love how this is a high-seas adventure without having anything to do with pirates. Have you noticed that’s the big theme now-a-days? Everything involving ships or the ocean always has a pirate association. This is just a girl, in a seemly normal situation, who must push her boundaries and decide what is right and wrong. It’s a quick read (a pretty short book) but exceptionally engaging. It didn’t win for its year–it was beaten by Maniac McGee in 1991–but it is a fabulous book, and one that should be read by anyone addicted to oceanic adventures. Have I told you about Newberry Award books yet? No? Well, I’ll just have to write something for you, now won’t I? Anyhow, I collect Newberry Award winners, and will eventually write a series of essays comparing and contrasting the winners each year. Maniac McGee was one of only 2 Newberry Award books in 1991, and beat out True Confessions of Charlotte Doyle for the gold. I must say, I liked Charlotte a little bit better, but then that just could be because I was in a high-adventure mood when I read it. Maniac McGee is the story of an orphan who lives on his own for a few years after his parents die. He returns to his old town, only to be caught up in a vicious race struggle between the town’s residents. Maniac uses his natural charm to help bridge the gap between the citizens, and has some adventures on his own in the mean time. It was a great, easy read, and passed on a message that is common in Newberry Award winners: race doesn’t matter. The second installment of Phillip Pullman’s His Dark Materials trilogy, The Subtle Knife was my favorite. It starts off kinda slow, with a rather uninspired catching-up of past events and introduction of new characters, but then it really takes off. Not only is this the most action packed of the three books, with edge-of-your-seat suspense and chode-numbing close calls, it also is the most surprising. For near the end, a great unmasking occurs. It turns out that while pretending for most of two books to be a better than average kid’s adventure series, His Dark Materials is also a compelling science fiction story. I will go into more details with my review of the final book. Adrienne made me read this book. The timing was weird, because shortly before I started reading it, I was paging through a copy of the Watchtower magazine that some Jehova’s Witnesses (who fortunately were only looking for Spanish-speaking targets) had left me, when I found a Golden Compass reference. Apparently that was the name that the most prolific bible-printer of the 19th (maybe) century gave to his … printery? It got me wondering, and I eagerly began reading Pullman’s Golden Compass in hopes of finding some devious connection. Alas, I did not, but it was still a good book. The setting of the book is intriguing. It at first seems kinda like olden-times England, but it’s way not. The fact that Pullman is able to reveal the setting without the characters ever becomming aware of their strangeness, and without ever just coming out and saying what’s going on, is impressive. Probably my favorite thing about this book. That’s not to say that the story is not good. It follows a girl named Lyra as she travels across Europe experiencing adventures and uncovering mysteries and such. But it is a little ordinary, while the setting is special.